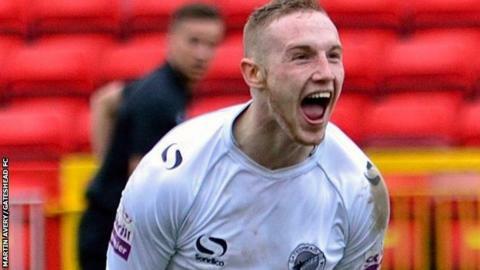 Gateshead manager Gary Mills says League One side Peterborough are one of several clubs interested in signing forward Marcus Maddison. Maddison, 20, has scored three goals in as many games for the Tynesiders this season, prompting discussions with Posh over a potential transfer. He scored nine goals in 32 matches last term as Gateshead reached the Conference Premier final at Wembley. "We've had contact with Peterborough and an offer," he told BBC Newcastle. "But we've got other clubs that are watching him. Marcus and his agent have got to decide what happens. "Whether he goes or whether he doesn't, we'll see before the deadline." Mills has already spoken of Maddison's talents and is aware of the former Newcastle trainee's ambitions. "As a club we can obviously say 'definitely not', but then we have the issue of a player who wants to go and play in the league and develop his career," Mills added. "It's not as simple as just there is a bid and they can take him. For me to replace someone like Marcus who is on fire in the Conference is virtually impossible."